"As part of the Europe, future past project, over the last few months we have been trying out different strategies for examining the archive and legacy of the militant film tradition of the 60s and 70s. The aim is to test a hypothesis, namely that our present situation, characterised by the recession and social mobilisation, places us in an ideal position from which to re-view these images, to reflect upon the questions they pose and to ask ourselves about memory and oblivion in relation to the 1968 international cycle of struggles. And indeed, far from being a lifeless mound of materials, the archive is in fact a living collection of traces, testimonies and questions that may engage with the imagination of the present time, and therefore participate in the invention of possible futures. The symposium: The Capture of Speech. 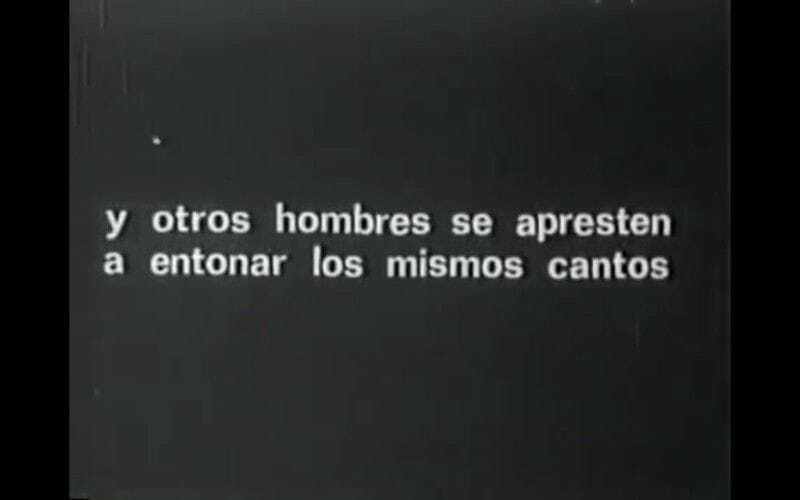 Dialogues with the militant film archive, is therefore simply another chapter in an ongoing process of research and investigation. Guest speakers include a number of different filmmakers, artists and researchers whose work is in some way related to the militant film archive. The backbone of the event is the idea of dialogue. Or rather dialogues, in plural, because our aim is to test out different ways of engaging in conversation with the militant archive. A series of dialogues then, with one foot in the audiovisual world and the other in the discursive sphere, halfway between theory and practice, between past and present; a hybrid mix of screenings, debates and performances. In short, a dialogue between images and words. Our feeling is that we cannot separate the militant film project from words. But not just any words. Rather, words taken by force; the words Michel de Certeau was referring to when, shortly after May '68, he wrote: 'Last May speech was taken the way, in 1789, the Bastille was taken.' And indeed the militant archive is full of words engaged in some kind of struggle. It is almost as if the lightweight cameras and tape recorders that merged together in the struggles of the 60s and 70s also became mixed up with the different meanings of the verb 'to take': to capture by force (a square, for instance), but also to film or record photos or images. Thus, in the militant films, speech (and the rights that come with it) is taken by the peoples of the south, students, inmates, housewives, workers and heretic sexualities. These films, which themselves speak out so eloquently, were conceived as an invitation to engage in debate. In innumerable documents, manifestos and testimonials, militant films define themselves as unfinished works that must be completed by viewers through a process of collective debate. Thus, the militant film tradition spread around the world, through a complex network of interrelated images and words running through the nervous system of festivals and meetings, theatres and improvised screenings, manifestos and declarations, cerebral conversations and heated debates, and magazines and books that often took on the job of translating into words the content of films that could not be viewed.